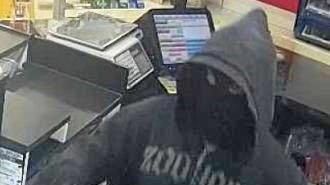 A MASKED robber who targeted a Mackay region convenience store while armed with a knife was still at large late yesterday. Mackay police officers had been searching for the man, but no new information was provided about his potential whereabouts. He held-up the Slade Point business about 9.25pm on Friday night. The culprit entered the store wielding a knife and demanded cash, Queensland Police Service said in a statement. As the robber attempted to flee on foot from the store on Finch Street, the robber was confronted by a 20-year-old Slade Point man. The altercation caused the robber to drop some of the stolen cash as he left the scene. Police have not revealed how much money was taken in the brazen robbery. Police urged anyone with information linked to the robbery to phone Policelink on 131 444. Information can also be forwarded through Crime Stoppers by phoning 1800 333 000.